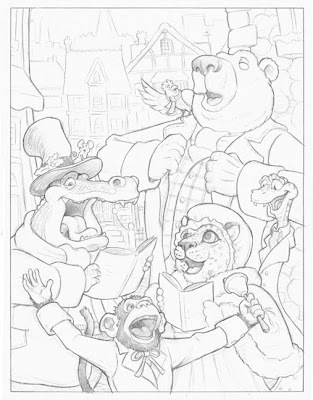 This is the sketch for this years Christmas card. Still have to make a few adjustments before I go to paint, but it’s close. Can’t wait to see it painted. I am loving the snake. for some reason, the fact that he is wearing a tie is so silly to me. I love it Mark!! I like the chimp the best, but you know me and monkeys. I think the hippo’s my fave. dying to see the final.